Ongoing renovation work at Travers Park has recently hit a significant marker as a large section of the park, shuttered over several months as part of the phased overhaul, reopened last week with new designs and fixtures to boast. 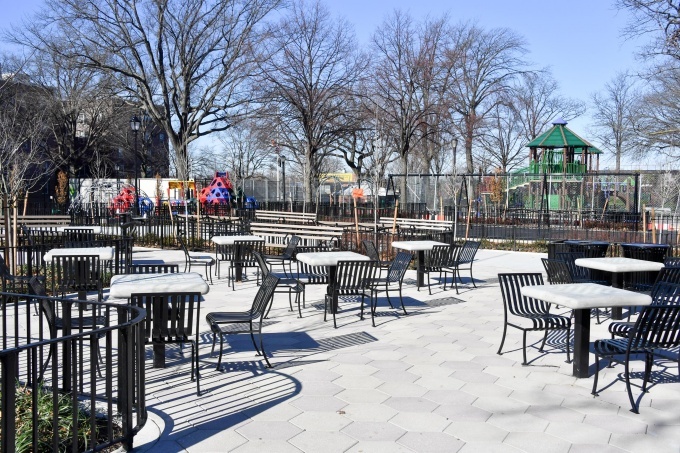 The park, located between 77th and 78th Streets and bordered by 34th Avenue to the south, had closed in early 2018, save for the area north of the handball courts, for a massive redesign that includes merging with two other parcels—the 78th Street Pedestrian Plaza and Staunton Field—to create one seamless open space. 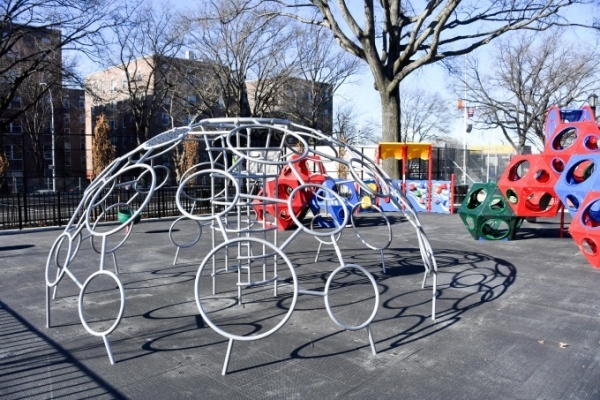 The recently reopened sections include the playgrounds, featuring new equipment for children; an adjacent eight-swing set; bench and table seating areas at the expanded 34th Avenue sidewalk; and the revamped multi-purpose field, once home to handball courts, that can be used for tennis and volleyball, among other uses. Much of the park’s concrete, patterned walkways are also open. The park’s new great lawn, however, will be surrounded by fencing until its sodded this spring, according to a NYC Parks spokesperson. 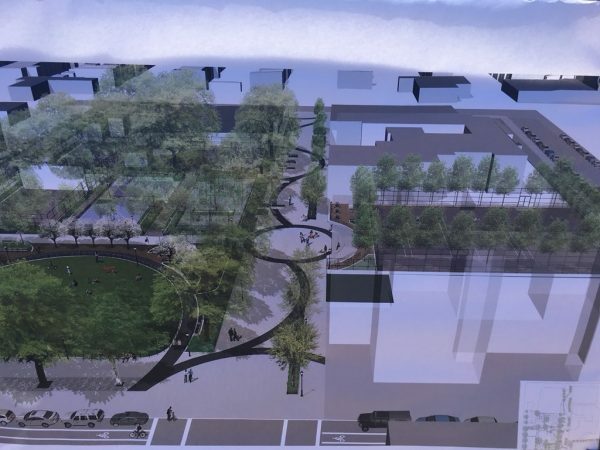 The overhaul is about three-fourths complete, in a project that will also see the 78th Street Plaza raised and with a performance area in the center, and upgraded asphalt fields at Staunton Field among other changes. The entire $7.1 million project, which will create a connected space beyond 2.5 acres, is slated to be finished in September. Construction on the highly-anticipated project began in March, although plans for the open space date back years before that after much community advocacy. The project’s design phase began in 2014, a year after the city purchased the Staunton Field property from the Garden School next to it, and finished about a year behind schedule in late 2016. Construction delays also set back the project by another year. Travers Parks’ tot lot is also preparing to undergo a $2 million redesign as part of a separate project. The capital project is in its procurement phase, with construction anticipated to start after March. Which lawn? I don’t remember grass in that park. Thanks for destroying the baseball field where people also played soccer snd cricket. Just to replace it with benches where people will be sleeping and bushes that will become a toilet for dogs and humans alike. You must be new to the neighborhood or don’t go to that park alot. Almost every day of the year there was people playing baseball, soccer, cricket and the sports in that field. I would know I can see that field from my window across the street. All types of people playing games, bike riding, and now that is no longer. No where to play anymore in the park because the ball field was replaced by benches for millenials to use vape pens and drink six dollar coffees. And for all these hipsters that just moved here from other states to take pictures of themselves eating ethnic foods so they can look cool and sophisticated to their facebook friends back in Wisconsin. I know many people that played sports at that field but never again will that be because Millenial JH doesn’t like baseball he likes making stupid videos and posting pics on the gram. And probably alot of other things that dont require any skill or effort. Enjoy your latte sweetie. Couldn’t agree more! What a shame, I grew up playing baseball there and to see it turned into a dump now is sad. Anyone notice the lawn floods when it rains? They should correct it with French drains or set up a better draining system. Why didn’t they upgrade the basketball courts? They are the most used area of the park and the most neglected by Parks. We often forget the teens in park redesign in favor of the younger kids. Stop dragging out the construction and get it done!! Do it before the summer this time so people can use the whole thing. Whoever scheduled this project needs to be fired. Yes, the greatest challenge after building the park is to police it and keep pot smokers, bums, vandals, dog violators etc. out of the park. I propose 2000$ fine to owners of $hitting dogs. Also dog confiscation could be a good idea too. NYC parks dept should make sure that dog owners clean up after their pets . Yes please… strict rule should be passed ..
Keep the vandals and pot smokers out and it will be a nice park. Are you kidding in this neighborhood!! What have marijuana smokers done to you? With all the taxes on cigarettes non-smokers should be required to carry matches in case I need a light.